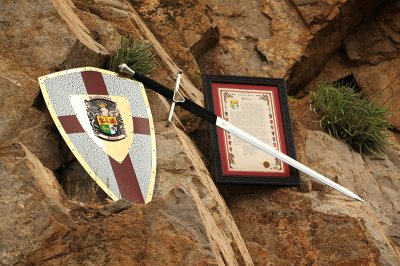 The Warrior Set comes complete with a sword, a shield bearing your family coat of arms, and a framed history of your family name. As we research and gain insight into your country of origin we will complete your warrior set with a sword corresponding to your heritage. The beautifully decorated shield included in this set is fabricated in steel and features your family coat of arms in bronzed-steel embossing, mounted over baked-enamel finishes. It is equipped with chain hangers and brackets for attaching one or two swords to the back of the shield. All coats of arms on your beautifully decorated shield are hand painted using true old world craftsmanship. Each family name history includes your name\'s country of origin, the meaning of your name, and fascinating historical records. All family histories also bear a Seal of Authenticity. 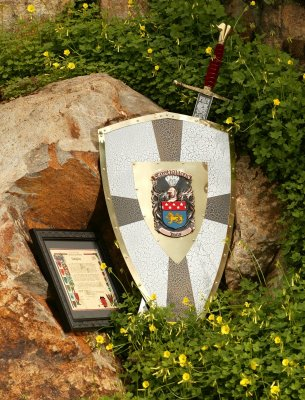 Your shield measures 31-1/2 inches in height, 18 inches wide, and weighs approximately 10 lbs. Dimensions of your framed family name are 16\" x 13\". The price of shipping is included in your warrior package.